Happy Friday guys.. I hope you all have a wonderful weekend..
LY brushes are not easily accessible in the US, atleast not in stores.. I purchased mine off of nordstrom.com.. Typically, LY brushes are handmade of natural sable hair and the brush handles are made of kiln dried birch or beech.. The brushes feel quite luxurious, are quite light & comfortable to hold.. So, I purchased four brushes – two eyeliner brushes and two crease/definer brushes..
LY manufactures three of crease brushes in the LY38 series comprising of LY38, LY38A and LY38B.. with each one made slimmer than the prior.. I decide to purchase the largest (LY38) and the slimmest (LY38B) of the series.. These costed $28 and $24 respectively.. I did the same for the eyeliner brushes… LY24 series.. purchased LY24 and LY24B.. These costed $20 and $17 respectively..
Here’s a comparison of these new LY brushes with my existing brushes in the same category.. I really enjoy these two brushes and definitely used them on my wedding day.. If I had to pick one amongst these two, I would highly recommend LY38.. You won’t be disappointed… LY38B is a great add on for precise color application and detailed crease work.. 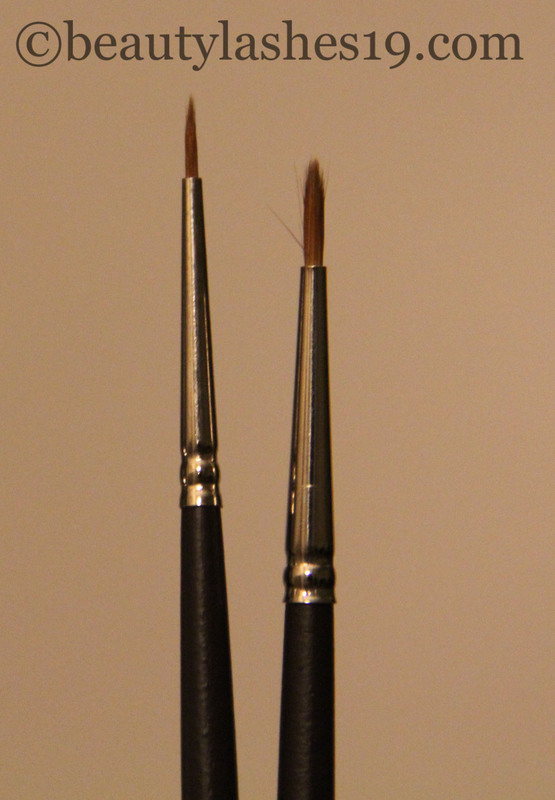 So, of course I compared my favorite cream/gel liner brushes.. From the images above, you can appreciate how thin the LY24 and LY24B are.. These come to a fine tip unlike the other two brushes.. LY24 is really comfortable to use and makes for a great addition to my other eyeliner brushes… Something about the lightness of the brush or the cut or angle makes applying eyeliner really easy.. I would reserve LY24B for really detailed eyeliner effects.. and if I had to recommend one amongst these two, I would recommend the LY24..